A King County Park's contractor will be on site Thursday, November 8, around the south end of Lake Wilderness area to remove a hazardous tree. This will require us to close the trail for the day (8 a.m. - 4 p.m.) to insure public safety and allow crews to use appropriate methods for removal. 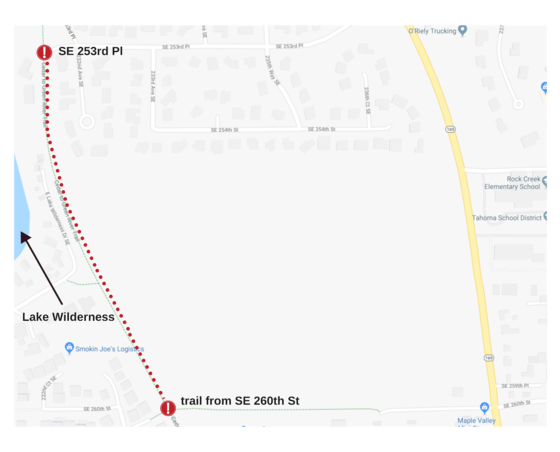 The closure will take place from SE 253rd Place in the north, to the intersection of the dirt trail that extends from SE 260th Street in the south (see map below for details). Contact parksinfo@kingcounty.gov or call 206-477-4527 with any questions or concerns.